French painter, the most important teacher of his generation. He taught Nicolas Poussin, Philippe de Champaigne and Laurent de La Hire. His own style, concentrating on bold compositions with bright colour, seems scarcely to have influenced his pupils. 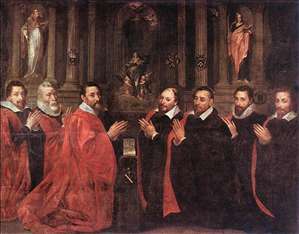 His most important surviving work, The chevins of Paris in the Muse Carnavalet, Paris, is a rare example of a group portrait from the period. See more details about "The Échevins of Paris Praying before St Geneviève"